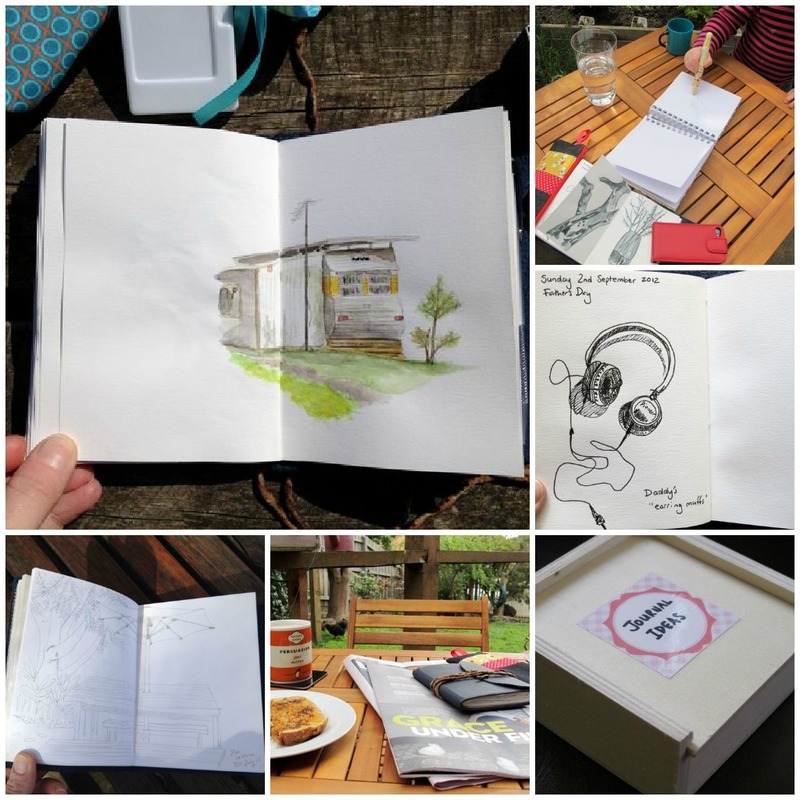 Jodi Wiley Sketchblog: What's an artist's journal for? What's an artist's journal for? Earlier this year I participated in a mystery gift exchange which, to my utter astonishment, resulted in the most beautiful leather-bound sketchbook arriving in my mailbox. Sonya from Sago on Tuesdays is a true artisan, keeping alive the age-old tradition of bookbinding. 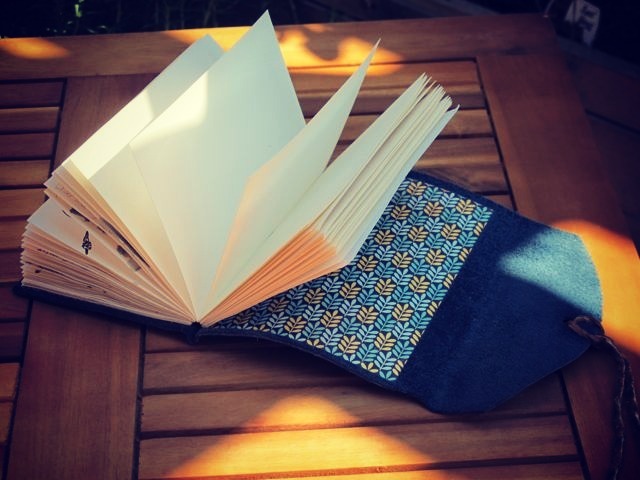 Each book is made with care, attention to detail and an obvious love of craft. I couldn't have been more thrilled to be the recipient of one of her journals. As I held this beautiful object in my hands I vowed I wouldn't be too scared to draw in it. I didn't really know what I wanted this journal to be so I just jumped in there and began (leaving the first page blank to circumvent those Starting a New Book jitters). Looking through it now I see there are a variety of attempts to reign in a theme: a series of location sketches, personal 'diary'-like pages recounting the day's events with an accompanying drawing, rough sketches and more polished pages. I've experimented with pen, watercolour, pencil, graphite stick, watercolour pencil and gouache. Midway through I started to notice that I was approaching the page with a kind of formal stiffness. I was always trying to make the page look good. I wanted to present my best self. It was about then that I lost motivation to work in it. Gradually it dawned on me that there was much more to gain if I could approach it with the freedom of never having to show anyone. There was so much I could learn about myself and how I work, so many happy accidents that could result from experimenting with different techniques and media. If I could just rid myself of all those self-imposed rules: 'this book will be location drawings only' or 'I will make every page "finished"' or 'this will be a record of my life' (eeek!) and just, you know, go with it. 'It' being whatever I felt needed to be expressed that day: either in words, or drawings. If I wanted to use it like a brain dump ('morning pages' style), I could. If I wanted to draw on location, fine. If I wanted to fine-tune a technique, nut out an idea, make rough sketches or more polished drawings, no problem. I started the journal in May. I'm now almost at the end of it. Recently I posted on Facebook a little personal challenge: could I finish it before the end of the year? Sonya upped the ante with the offer of sending me a new book if I could do it. Well, how could I refuse? Anyone would be thrilled to have in their possession one of her beautiful books - so to work in one again? Well, that's motivation enough for me. An artist's book should be a safe place to experiment, explore, refine ideas and techniques and, most importantly, make mistakes. Working in a journal can be cathartic, exhilarating, illuminating and meditative, sometimes all at once! It should be a place of complete freedom where anything goes and anything might happen. It's a journey of self-discovery and, over time, can form a personal record of the progression of ideas and the improvement of skills. Truthfully though, I'm still working out what my artist's journal is for and I expect I will be for some time. But what I do know is, I wouldn't be without one now.